This weeks CPS Sketch had me looking for my Fiskars Stamp Scissors to create the edges on my card stock as shown in the sketch. Remember buying those scissors? I'm sure you have them in your studio somewhere, dig 'em out and use them on today's sketch! 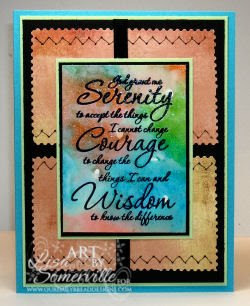 My focal image comes from Our Daily Bread Designs - Serenity Prayer. I used the Reinker Splash Technique to add color to my image. I Faux Stitched on my Marrakech paper onto my black panel. Wow, there are so many cool details on your card! Love that background, love that verse and love what you did with that CPS sketch. Beautiful card :) I love that prayer, so many gorgeous color's in your card! Very pretty card, Lisa. I love the colors you used! so beautiful and I love the sentiment. Thanks for playing! Lisa - this is beautiful. You did a great job using CPS's sketch !! This card just glows...it's truly beautiful and striking! This is beautiful! I love sentiment on it! Great job with sketch 105...thanks for playing at CPS this week! Those Fiskars stamp scissors are really cool! What a great use of the sketch - I love it. Super pretty! The colors in the background of the main image are fabulous!